It occurred to me recently that, at least among my closest family and friends, there seem to be two basic flavors of anxiety: past and future. Not to say that you can’t get a delicious, panic-inducing swirl of both if that’s your thing, but most people seem to relish one or the other. A few people I can think of pore over every detail of past events and past decisions. What if I had done this differently? What if this other person had gone another direction? What if any number of things that happened had not happened? This manner of hindsight anxiety is highlighted in the spectacular musical If/Then, which I recently saw on Broadway. I recommend it highly. The play, not the anxiety. I have little patience for this brand of anxiety. I am a practical person and I feel like what’s done is done and it serves no purpose to wonder what could have happened because it didn’t and it’s too late to turn back now and life goes on. I have plenty of time, however, to obsess about what might happen in the future, however remote the possibility may be. What if there’s an earthquake and the crack in the bricks outside our house makes the house collapse on my baby while he sleeps in his crib? What if we are in the wrong place at the wrong time and encounter a crazy shooter? What if we get a flat tire on the beltway? What if we run out of money? What if someone I love gets seriously ill? Or dies? The rewarding thing about this kind of anxiety is there are so many variations, layers, and nuances. Some of the worries are extremely unlikely and very much out of my control. Short of living inside a bubble, we assume the risks of living in the world and some of these are really scary these days. But still unlikely. And some are inevitable. Some people I know will get sick and someday will die. It’s already happened, for sure. But the prospect is still terrifying. Again, nothing I can do about it. I haven’t yet found a magic wand or fairy godmother or medical miracle to protect everyone I love and enable them to live forever. And then there are the worries that I could do something about, but are still hard to face. I could save money by going out to lunch less. But I love going out to lunch and it keeps me from going insane at home alone. I am frequently torn between the mantras of self-improvement and self-acceptance that are constantly swirling around me. Instead of removing the possible causes of future-predicting anxiety, what I need to do is attack the anxiety itself. I have meditated, but not in a long time. I don’t know why meditation, which is so simple, can be so intimidating. I do yoga, but have not had a regular practice since my 13-year-month old was born. Even after he was born I enjoyed mommy-baby yoga with him for a while, but once he started crawling the jig was up. I’m trying to find a way to create a new practice for myself. I was going to go to a new class today, but didn’t count on the rush hour traffic and had to cancel at the last minute when I discovered I would get there 15 minutes late. Happily, the studio owner called me back right away to say I wouldn’t lose the class despite the late cancel and suggested some classes I could take that aren’t during rush hour. So I took a four-mile walk, and it’s a beautiful day, and that was good. Mister Rogers said in the midst of tragedy to look for the heroes, and it’s easy when you’re anxious to turn minor annoyances into major catastrophes, because they might become larger scale annoyances or even genuine problems. But I try to look for the heroes, even the minor ones. Last Friday afternoon I had just picked up Zeke from day care and I was on my way to pick up Zoe from school, after which we were headed out of town for a weekend away with friends. I ran out of gas, which was dumb. I’ve never done that before. And likely I will never do it again. But I did, and it turns out in our minivan, the two gallons you can put in with the gas can that the nearby service station loaned me is not enough to get it started again. You need four gallons. So by the time I discovered this, Zeke and I had spent a while hanging out on the sidewalk in front of the house where our car had conked out. Hero number one was the guy whose house it was, who came out to ask if I could move the car because his wife was headed home and I was blocking the driveway. I explained my situation and he was totally understanding and asked if I needed anything. I desperately needed to pee, so he invited me in to use the bathroom. Hero number two was the AAA service guy who arrived to see if I needed a jump start. I didn’t, and he suggested I probably needed more gas. He asked if there was anything else he could do for me and I guess could see I was getting a little upset. He asked if I was thirsty and gave me a bottle of cold water he had in his truck. I’ve never had a AAA driver offer me water before. I’m sure that was his own supply of water for him to drink. I was grateful. Heroes number three and four: my parents, who immediately came when I called and split up to retrieve each of my children and bring them home while I waited for a tow truck or more gas (before I knew what the problem was). Hero number 5: my husband, who came and picked up the gas can and refilled it and came back to me with more gas, which enabled the car to start. And everyone was kind and patient and no one made fun of me for running out of gas. And we made it to West Virginia with our friends, even though we got there after 10pm. We missed all the traffic and drove in the cool darkness and Zeke slept and Zoe watched Frozen and all was well. All of my anxieties about what was wrong with the car, how much it would cost to fix, the prospect of Zoe freaking out that she hadn’t been picked up yet, the prospect of Zeke freaking out on the sidewalk, none of them came to fruition. It was a sunny day, everyone helped, and it was ok.
People can do anything. So why haven’t these things been invented? One would be immensely practical. The other more personally appealing to preserve my mental health. 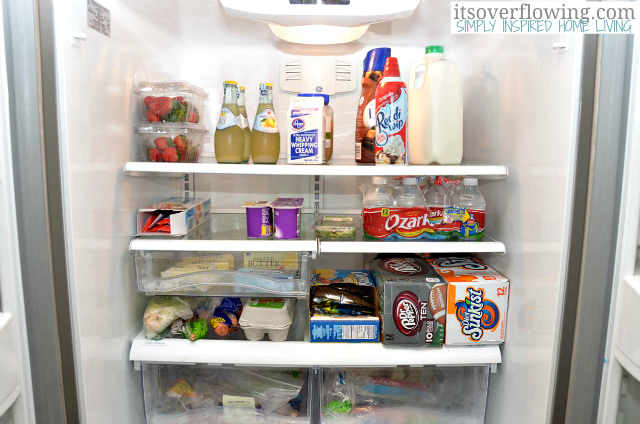 There should be an interactive digital display on your fridge door that you can use to see what’s in your fridge and how long it’s been there and when it expires. You could scan all the items as you put them into the fridge, and the device would already be programmed with information about, say, how long strawberries stay fresh. You could also manually enter expiration dates, like on your milk. The device would remember everything you put in, so when you first get it you might have a lot of data entry to do, but after that it would easily recognize what you’re buying. Then when you are wondering what you can have for dinner, all you have to do is look at your display and see that there’s leftover Thai from two nights ago and enough vegetables to make a salad. When you’re getting ready to go to the grocery store, you could print out–or upload to your phone–a list of what you need, based on what you usually need and is missing from or low in the fridge. For bonus points, the device could interact with a cooking app and suggest recipes based on the ingredients you have on hand. Or tell you that you have five ingredients you need for tacos, except the meat, so you should pick some up. Cleaning the fridge would be easy because you’d know exactly how long things had been in there even before the mold starts to grow! There is so much potential here. Sometimes when you’re in the car with your kids and you turn on NPR and the first words you hear are “mass shootings” or “bodies of children” or “murder” and you have to switch the station very, very fast. Or even if your kids aren’t in the car but it’s 7:30 in the morning and you can’t stomach a report about terrorist attacks, children being sold into slavery, or anyone being shot, and you have to put on the soundtrack to If/Then, which can be kind of wrenching as well but at least you know what’s coming and it’s fictional. Anyway, there should be a little warning light indicator on your radio so you can turn it on with no volume and if there’s a horrifying story including any of the above words or others I could list but won’t because they will make me depressed, a red light would illuminate. If the story may be mildly disturbing but not heart-wrenching, such as unemployment numbers, Congressional ineptitude, or negligent landlords, the light is yellow. And, if you’re really lucky, the light will be green when they’re interviewing singers, athletes, or writers; sharing the triumphant story of someone’s success; or reporting on a breakthrough in medical technology. Not to say that you can never listen to bad news, but sometimes it’s just too much. This would save millions of listeners from potential anguish as they drive. If you can invent these things, let me know. I’d be happy to brainstorm with you and get in on the ground floor.